There are three things you can be sure of about us Coffee with Christ gals. First, we are girls who strive to be totally sold out for Jesus. Second, we really like our coffee. Third, we both struggle with taming our tongues. I don't own a pet parrot, but I have the next best thing - a 6 year old. Those of you who have small children understand that statement. Those that don't, let me explain. Young children shadow their parents constantly. Even to the point that for some of us going to the bathroom alone is a luxury. They see and hear everything you say - and they often repeat it at the most inopportune times. Have you been talking on the phone to a dear friend about Mrs. So-and-So who said such and such? You can bet that when your little darling sees Mrs. So-and-So she is going to ask about it! Did you get cut off in traffic and let some less than nice words fly with your child in the backseat? I can guarantee that isn't the last time you hear them. They are going to fall out of your child's mouth, and probably while you are standing in front of your pastor. It is easy to get upset at the one repeating, whether it is your child or a friend in which you were chatting with sharing your conversation with another. After all, they are sharing things that were spoken to them (or in front of them) privately. But the real issue isn't what they are saying, it's what came out of your (my) mouth to begin with. And it is an age old problem. Proverbs 21:23 says, "whoever keeps his mouth and his tongue keeps himself out of trouble". If you never said it, it could never be repeated. It could never create a problem. Matthew 12:34 takes it a step further, reminding us that our words are a reflection of our heart. Ouch! And he goes on to warn us in verses 36-27 that we will be judged for every careless word we speak. Double ouch! If that isn't enough to make you want to be more careful about the words you (I) speak I don't know what will! The good news is that we have help with this. 2 Corinthians 5:17 tells us that God is making us into a new creation since we have accepted the gift of salvation. The old is gone. Ezekiel 36:26-27 tells us that He has given us a new heart, and a new spirit that will help us to live according to His statutes. All we need do is listen for that Spirit to whisper to us, and then respond appropriately. You know, that voice that tells you you shouldn't be saying what is spewing from your mouth. The one that prods you to talk TO that person rather than about them. That is the Spirit of God attempting to direct you to the path you should be walking. 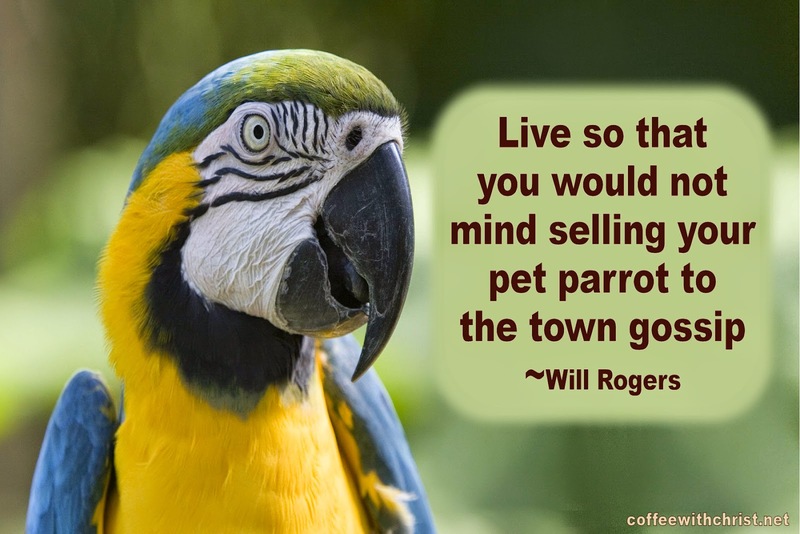 So don't live as if a parrot were in your house, rather live like the Spirit is in you....because He is.